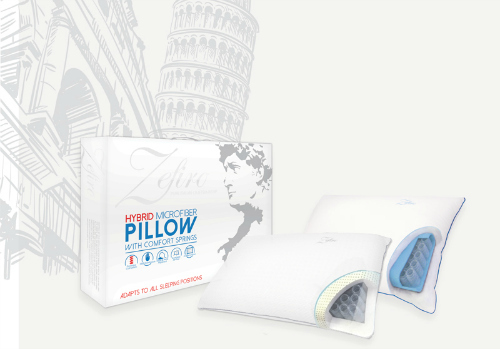 CHICAGO – The Zefiro memory foam innerspring pillow recently introduced by Protect-A-Bed, the sleep accessory specialist based here has earned the internationally recognized ErgoCert certification for neck and spinal alignment for all three of its versions, including soft, medium and firm. The company said the certification tests were conducted in the Ergonomics Laboratory at Udine, Italy, and employed six users across a range of body sizes, each of whom used every version of the pillow. Each user wore the specially designed MVN Biomech Awinda System. Equipped with 17 integrated sensors including accelerometers and gyroscopes, the system provides detailed posture and response data allowing digital modeling and precise analysis. In order to earn ErgoCert approval, products are required to show less than 20º misalignment between neck and spine in supine (back sleeping) position and less than 14º misalignment during lateral (side sleeping) positons. In each test, Zefiro showed significantly less deviation, consistently out-performing certification requirements. “The performed analysis highlighted that any incongruous postures fell well within the optimal limits both for the supine and lateral position, irrespective of pillow variations and tester bodies,” reads the report created by Dr. Francecsco Marcolin and Dr. Marco Bordignon, both certified European ergonomists. Hand-crafted in Italy, Zefiro features a bed of individually-wrapped harmonic steel springs, surrounded by perforated viscoelastic polyurethane layer, designed to increase the individualized support for optimum fit and conformity to each sleeper. But proper ergonomics is not the only benefit of the Zefiro pillow. “The responsiveness of the internal springs encourages breathing throughout Zefiro as sleepers change positions,” says Bell. “This airflow leads to cooler sleep temperatures, and encouraged us to pick the name Zefiro which translates from Italian to ‘a light west wind’." Zefiro is available in soft, medium and firm comforts and is ready for shipping to members of Protect-A-Bed’s retail network. Memory foam and microfiber fill options are available.